That was the message from London Assembly member Val Shawcross at our annual meeting in Brixton in May. Val joined us to give an overview of her work as Chair of the Assembly’s Transport Committee and Assembly Member for Lambeth and Southwark. The Assembly has a key role overseeing the work of the Mayor (Boris) and Transport for London. She told us that we (cyclists) were winning the argument at City Hall and across TfL thanks to the number of cyclists and the consistent messages being sent to policy makers. Shawcross outlined three phases of cycling policy since the creation of the Mayor and Assembly in 2000 – first off was what she termed the ‘Socialist Redesign’ phase when under Ken Livingstone 2000-2008 TfL started thinking big about shifting people from private to public transport and putting the systems in place to encourage greater cycle use. In phase two under Boris Johnson grand schemes such as the cycle hire scheme –Livingstone’s original idea- and cycle superhighways came into being to cater for cyclists but the overall thrust of policy was to ‘smooth the flow’, ie make it easier for drivers, to the detriment of other road users. Since late 2012 Shawcross stated there was a new thinking in TfL and City Hall and finally a recognition that cyclists’ needs should be prioritised in the road user hierarchy. 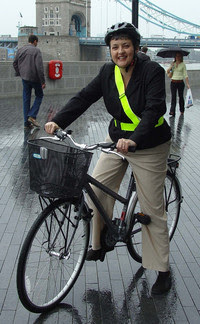 She cited the appointment of cycling ‘tsar’ Andrew Gilligan and the Mayor’s vision as examples of the new thinking. Shawcross mentioned also the importance of increased numbers of cyclists and the clear consistent messages from the cyclists’ lobby which made it easier for the Assembly to push the Mayor on this issue. The Assembly for example recently made the case that 2% of transport spending should be on cycling to match the 2% of journeys made by bike. What will it mean for Lambeth? Pressed on what this new settlement will actually mean for cyclists in Lambeth she said that the junctions review, two way traffic plans for Vauxhall Cross and the abolition of gyratory systems were all in progress whilst 20mph speed limits on TfL roads and ensuring that new developments could cope with future increased cycling as well as existing demand were in progress. She said that she was sure that within five years London would be a far more cycle friendly place.